It has long been established that lower vertebrates, most notably fish and amphibians, are resistant to the toxic effect of LPS. Furthermore, the lack of a TLR4 ortholog in some fish species and the lack of the essential costimulatory molecules for LPS activation via TLR4 (i.e., myeloid differentiation protein 2 (MD-2) and CD14) in all the fish genomes and expressed sequence tag databases available led us to hypothesize that the mechanism of LPS recognition in fish may be different from that of mammals. To shed light on the role of fish TLRs in LPS recognition, a dual-luciferase reporter assay to study NF-κB activation in whole zebrafish embryos was developed and three different bony fish models were studied: 1) the gilthead seabream (Sparus aurata, Perciformes), an immunological-tractable teleost model in which the presence of a TLR4 ortholog is unknown; 2) the spotted green pufferfish (Tetraodon nigroviridis, Tetraodontiformes), which lacks a TLR4 ortholog; and 3) the zebrafish (Danio rerio, Cypriniformes), which possesses two TLR4 orthologs. Our results show that LPS signaled via a TLR4- and MyD88-independent manner in fish, and, surprisingly, that the zebrafish TLR4 orthologs negatively regulated the MyD88-dependent signaling pathway. We think that the identification of TLR4 as a negative regulator of TLR signaling in the zebrafish, together with the absence of this receptor in most fish species, explains the resistance of fish to endotoxic shock and supports the idea that the TLR4 receptor complex for LPS recognition arose after the divergence of fish and tetrapods. The TLR multigene family comprises a family of transmembrane proteins first described in Drosophila. They are highly conserved in both the invertebrate and vertebrate lineages (1, 2). In mammals, these receptors are mainly involved in host defense, whereas in Drosophila, Toll receptors are also involved in development (3). All family members share the same structure, defined by the presence of leucine-rich repeats (LRRs)4 in their extracellular domain and by the presence of a Toll/IL-1 receptor domain (TIR domain) in the C-terminal, the cytosolic part of the protein that initiates signal transduction (4). TLRs recognize a variety of highly conserved pathogen-associated molecular patterns (PAMPs), which are essential for pathogen survival (5). The interaction of a given PAMP with its specific TLR leads to the expression of inflammatory cytokines and chemokines and to the activation of antimicrobial host defense mechanisms, such as the production of reactive nitrogen and oxygen radicals and antimicrobial peptides. To date, a complete set of TLRs has been described in two phylogenetically distant teleost fish species, namely the pufferfish Fugu rubripes and the zebrafish Danio rerio. This set includes orthologs of the 10 mammalian TLR families and 2 fish-specific members (6, 7, 8, 9). Additionally, it seems that some of these orthologs are functionally analogous to their mammalian counterparts (10, 11). However, one of the most striking aspects found in these genomic studies is that while the zebrafish has two TLR4 paralogs, more evolutionarily advanced pufferfish, namely Fugu and Tetraodon, lack a TLR4 ortholog (6, 7). LPS is the major component of the outer membrane of Gram-negative bacteria. Structurally, it is composed of a core polysaccharide and an O-polysaccharide of variable length, as well as a lipid portion termed “lipid A”, which is the responsible for the activation of the innate immune response in mammals and confers its endotoxic properties (12, 13). Different bacteria produce structurally different LPS molecules, varying in their phosphate patterns, number of acyl chains, and fatty acid composition. Bacterial mutants that fail to add the inner core or the O-specific chain are said to produce “rough LPS” (R) because of the morphology of the colonies they form. Wild-type strains produce “smooth LPS” (S) and grow as smooth colonies. LPSs are amphipathic molecules whose hydrophobicity decreases with increasing length of the sugar part. Due to these differences, the S and R forms show marked differences in their abilility to activate mouse macrophages and splenocytes (14). In mammals, the mechanism by which LPS initiates a signal was solved in 1998 by positional cloning, which revealed that TLR4 is the central component of the LPS receptor (15). To date, there is much evidence that supports the view that activation of cells by LPS is mediated by the TLR4 and that it is critically involved in the etiology of LPS-induced septic shock (16, 17, 18). For functional interaction with LPS, TLR4 must be associated with myeloid differentiation protein 2 (MD-2) (also known as LY96) (19, 20), and activation of TLR4 is preceded by the transfer of LPS to membrane-bound or soluble CD14 by LPS-binding protein (LBP) (21, 22). Interestingly, a recent structural study has demonstrated that MD-2 is actually responsible for the binding of LPS (23). Additionally, CD14 is dispensable for the recognition of R-form LPS and lipid A but is indispensable for the recognition of the S-form LPS (14, 18). This scenario is even more complicated since some LPSs (from Leptospira interrongans and Porphyromonas gingivalis), which are structurally different from those of enterobacteria, have been shown to activate cells through TLR2 and/or TLR4 (24, 25, 26). Thus, P. gingivalis LPS has also been shown to be active in macrophages from C3H/HeJ mice (27, 28), which possess a point mutation in the tlr4 gene that precludes signaling by enterobacterial LPS (15, 17). Additionally, cell activation with P. gingivalis LPS via TLR2 required heterodimerization with TLR1 and was MD-2-independent, while cell stimulation via TLR4 was shown to be MD-2- and CD14-dependent (26). Downstream signaling by the TLR4 receptor involves several intracellular TIR domain-containing adaptors mediating proinflammatory gene expression (29, 30). Two pathways that initiated downstream TLR4 signaling are known, namely the MyD88 and TIR domain-containing adapter inducing IFN-β (TRIF)-dependent pathways. Initiation of the MyD88-dependent pathway leads to the activation of NF-κB and the transcription of several proinflammatory genes (31). A second pathway is mediated by the TIR-containing protein called TRIF-related adapter molecule (TRAM) (also know as TICAM2) and TRIF) (also know as TICAM1). 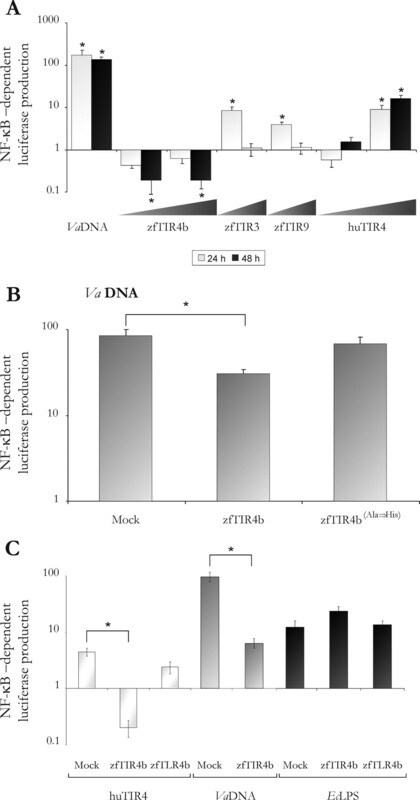 Initiation of the TRIF-dependent pathway leads to the activation of IFN-regulatory factor 3 (IRF3) and the expression of INF-β and IFN-inducible genes (5). It has long been established that lower vertebrates, most notably fish and amphibians, are resistant to the toxic effect of LPS (32). Indeed, note that in many in vitro studies on leukocytes from different fish species, extremely high concentrations of LPS (μg/ml) have been used to activate immune cells (33, 34, 35, 36, 37) in comparison to studies on mammals (ng/ml). Furthermore, the lack of a TLR4 ortholog in some fish species as well as the lack of the essential costimulatory molecules for LPS activation via TLR4 (i.e., MD-2 and CD14) in all the fish genomes and expressed sequence tag databases available led us to hypothesize that the mechanism of LPS recognition in fish may be different from that of mammals. To shed light on the role of fish TLRs in LPS recognition, three different bony fish models were studied: 1) the gilthead seabream (Sparus aurata, Perciformes), an immunological-tractable teleost model in which the presence of a TLR4 ortholog is unknown; 2) the spotted green pufferfish (Tetraodon nigroviridis, Tetraodontiformes), which lacks a TLR4 ortholog; and 3) the zebrafish (Danio rerio, Cypriniformes), which possesses two TLR4 orthologs. Stimulation of leukocytes from seabream and pufferfish in vitro with different ultrapure LPS preparations and lipid A demonstrated that the leukocytes from both species were able to respond to different LPSs and lipid A from Escherichia coli but failed to respond to R- and S-form LPS and lipid A from Salmonella spp. Additionally, we developed a zebrafish embryo model to study LPS signaling in vivo using a classical NF-κB-luciferase reporter assay together with antisense morpholino (MO)-mediated knockdown or gene overexpression. The results obtained demonstrated that LPS signaled in a TLR4- and MyD88-independent manner and that, surprisingly, the zebrafish TLR4 orthologs negatively regulated the MyD88-dependent NF-κB activation by sequestering the TLR adaptors. Therefore, our results could help explain the resistance of fish to endotoxic shock and support the hypothesis that the TLR4 receptor complex for LPS recognition arose after the divergence of fish and tetrapods. Healthy specimens (150 g mean weight) of the hermaphroditic protrandrous marine fish gilthead seabream (S. aurata) were obtained from Culmarex. They were kept in 260 liters of recirculating seawater aquaria (flow rate 1500 L/h) at 20 ± 2°C with a 12-h light/dark cycle and fed with a commercial pellet diet (Trouvit) at a feeding rate of 1% body weight/day. Spotted green pufferfish (T. nigroviridis) were purchase in a local pet shop. Zebrafish (D. rerio) of the AB, TL, and WIK genetic backgrounds were kindly provided by the Zebrafish International Resource Center and maintained as described in a zebrafish handbook (38). Seabream head kidney (bone marrow equivalent in fish) leukocytes, obtained as described elsewhere (39), were maintained in sRPMI (RPMI 1640 culture medium (Invitrogen) adjusted to gilthead seabream serum osmolarity (353.33 mOsm) with 0.35% NaCl) supplemented with 5% FCS (Invitrogen) and 100 IU/ml penicillin and 100 μg/ml streptomycin (P/S; Biochrom). Some experiments were conducted using purified cell fractions of macrophages and acidophilic granulocytes, the two professional phagocytic cell types of this species (39, 40). Briefly, acidophilic granulocytes were isolated by MACS using a mAb specific to gilthead seabream acidophilic granulocytes (G7) (39). Macrophage monolayers were obtained after overnight culture of G7− fractions in FCS-free medium and their identity was confirmed by the expression of macrophage CSF receptor (M-CSFR) (40). Seabream macrophages, acidophilic granulocytes, and total leukocytes from seabream head kidney were stimulated for different incubation times at 23°C with 0.1–10 μg/ml LPS of E. coli (EcLPS, strain 0111.B4, Sigma-Aldrich), 0.1–10 μg/ml ultrapure S-form LPS from Salmonella abortus equi (S-SaLPS, Alexis Biochemicals), 0.1–10 μg/ml ultrapure R-form LPS of Salmonella minnesota (R-SmLPS, Alexis Biochemicals), 0.1–10 μg/ml ultrapure LPS of P. gingivalis (PgLPS, InvivoGen), 1–10 μg/ml diphosphoryl lipid A of E. coli (EcLipid A, Sigma-Aldrich), or 0.1–10 μg/ml diphosphoryl lipid A of Salmonella thyphimurium (StLipid A, Sigma- Aldrich) in sRPMI supplemented with 5% FCS and P/S. Spotted green pufferfish head kidney leukocytes were stimulated for several incubation times at 23°C with 10 μg/ml ultrapure EcLPS (strain 055:B5; Alexis Biochemicals), 10 μg/ml ultrapure EcLPS (0111:B4; Alexis Biochemicals), 10 μg/ml LPS of PgLPS, 50 μg/ml phenol-extracted genomic DNA from Vibrio anguillarum ATCC19264 cells (VaDNA), or 1 μg/ml flagellin (Invivogen) in RPMI 1640 culture medium supplemented with 5% FCS and P/S. Respiratory burst activity was measured as the luminol-dependent chemiluminescence produced by seabream head kidney leukocytes (41). This was brought about by adding 100 μM luminol (Sigma-Aldrich) and 1 μg/ml PMA (Sigma-Aldrich), while the chemiluminescence was recorded every 117 s for 1 h in a FLUOstart luminometer (BMG Labtechnologies). The values reported are the average of quadruple readings, expressed as the slope of the reaction curve from 117 to 1170 s, from which the apparatus background was subtracted. Four adult zebrafish were anesthetized by immersion in benzocaine (100 μg/ml) (Sigma-Aldrich) before injection. Each fish was injected in the left epaxial muscle with 1 μl of PBS containing 5 μg of EcLPS, 5 μg of PgLPS, 0.1 μg of flagellin, or 2.5 μg of poly(I:C) (Invivogen). Tissue samples from the injection site were collected at different time points and processed for gene expression analysis (see below). Total RNA was extracted from cell pellets with TRIzol reagent and purified with PureLink Micro-to-Midi total RNA purification system (Invitrogen) following the manufacturer’s instructions and treated with DNase I, amplification grade (1 U/μg RNA; Invitrogen). The SuperScript III RNase H− reverse transcriptase (Invitrogen) was used to synthesize first-strand cDNA with oligo(dT)18 primer from 1 μg of total RNA at 50°C for 50 min. Real-time PCR was performed with an ABI Prism 7500 instrument (Applied Biosystems) using SYBR Premix Ex Taq (Takara Bio). Reaction mixtures were incubated for 10 min at 95°C, followed by 40 cycles of 15 s at 95°C, 1 min at 60°C, and finally 15 s at 95°C, 1 min 60°C, and 15 s at 95°C. For each mRNA, gene expression was corrected by the ribosomal protein S11 (rps11) (Tetraodon and zebrafish) or rps18 (seabream) content in each sample. The primers used are shown in Table I⇓. In all cases, each PCR was performed with triplicate samples and repeated at least twice. The zebrafish (zf)TLR4b (BC068358) and zfTLR3 (NM_001013269) coding sequences were obtained by PCR amplification with Pfu DNA polymerase (Fermentas) using full-length cDNA clones provided by ImaGenes (IRBOp991G0340D and IRBOp991H0571D, respectively) as templates. The PCR amplified fragments were incubated at 72°C for 10 min with 1 unit of TaqDNA polymerase (Invitrogen) for addition of 3′ A-overhangs and cloned into pcDNA3.1/V5-His-TOPO expression vector (Invitrogen) for expression of V5/His6-tagged proteins. All constructs were sequenced using an ABI Prism 377 (Applied Biosystems). The full coding sequence of the zfTLR4a (XM_001335971) as well as zfTIR3 (NM_001013269), zfTIR9 (NC_007119), wild-type zfTIR4b, and zfTIR4b (713Ala→His) truncated versions containing the transmembrane and intracellular domains were synthesized by GenScript and then subcloned into the BamHI restriction site of a pcDNA6/V5-His construct in frame with the sequence coding for the powerful signal peptide of the seabream type II IL-1 receptor (42). The NF-κB luciferase reporter was provided by Dr. R. Hay, the huTIR by Dr. R. Medzhitov, and the huTLR4, huMD-2, and huCD14 constructs were provided by Dr. M. F. Smith, Jr.
Plasmid DNA was prepared using the MiniPrep procedure (Qiagen). DNA pellets were resuspended in water and further diluted, when required, in PBS. Transfections were performed with a cationic lipid-based transfection reagent (LyoVec; InvivoGen) according to the manufacturer’s instructions. Briefly, HEK/Elam-luc cells (provided by Dr. M. Lamphier) were plated in 24-well plates (120,000 cells/well) together with 25 μl of transfection reagent containing a total of 250 ng of total plasmid DNA. The Renilla luciferase expression vectors pRL-CMV or pRL-TK (Promega) were used at a ratio of 10:1 as internal controls to normalize the values obtained with the firefly luciferase construct. Forty-eight hours after transfection, cells were washed twice with serum-free medium and lysed in 100 μl of lysis buffer (10 mM Tris-HCl (pH 7.4), 1% SDS). The samples were boiled in SDS sample buffer, resolved on 8% SDS-PAGE, and transferred for 30 min at 200 mA to nitrocellulose membranes (Bio-Rad). Blots were probed with specific Ab to the V5 epitope (Invitrogen) and developed with ECL reagents (GE Healthcare) according to the manufacturer’s protocol. Forty-eight hours after transfection, cells were stimulated for 8 h with the specific ligand for each TLR at the concentrations indicated above, washed, and lysed with passive lysis buffer (Promega). Firefly and Renilla luciferase activity was measured by using the Dual luciferase assay kit (Promega), as specified by the manufacturer, to discriminate the activity of the two types of luciferases, in an Optocomp I luminometer (MGM Instruments). Splice- or translation-blocking MOs were designed and purchased from Gene Tools (Table II⇓) and solubilized in water (1 mM). MOs (4 ng/egg), expression plasmids (0.1–1.0 ng/egg), firefly and Renilla reporter plasmids (100 and 10 pg/egg, respectively), and the required PAMP (6.5 ng of VaDNA or 30 ng of EcLPS) were mixed in microinjection buffer (0.5× Tango buffer and 0.05% phenol red solution) and microinjected (4–6 nl) into the yolk sac of one-cell-stage embryos using a microinjector Narishige IM-300. The firefly and Renilla luciferase activities were determined 24 h postinjection as described above in 5–10 replicates (each one containing the tissue extracts from three embryos). Data were analyzed by ANOVA and a Tukey multiple range test to determine differences between groups. The differences between two samples were analyzed by Student’s t test. The ability of LPS from different sources to modulate the respiratory burst of seabream head kidney leukocytes in vitro was analyzed. Ultrapure EcLPS and PgLPS were both seen to increase the respiratory burst of these cells in a dose-dependent manner, although the activation with PgLPS was significantly higher (Fig. 1⇓A). Notably, ultrapure EcLPS showed lower activation ability than the commonly used phenol-purified EcLPS since these preparations are often contaminated with other cellular components. In contrast, S-LPS and R-LPS, both from Salmonella spp., failed to activate the respiratory burst of seabream leukocytes. Consistent with these observations, head kidney leukocytes were also able to respond in a dose-dependent manner to diphosphoryl lipid A from E. coli but not from S. typhimurium (Fig. 1⇓B). LPS primes the respiratory burst of seabream leukocytes in vitro. Head kidney leukocytes were incubated for 16 h with the indicated concentrations of non-ultrapure (nu) EcLPS, or ultrapure EcLPS, S-SaLPS, R-SmLPS, and PgLPS (A) or EcLipid A and StLipid A (B) and their respiratory burst activity was measured as the luminol-dependent chemiluminescence triggered by PMA. 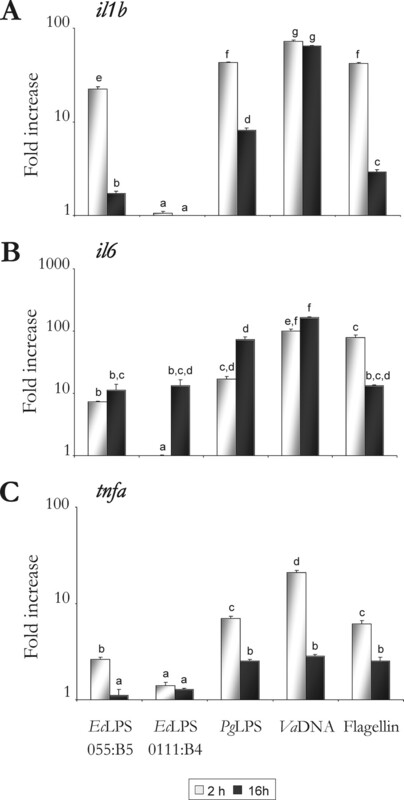 Data are presented as means ± SE fold increase relative to cells incubated with medium alone and are representative of several independent experiments. Different letters denote statistically significant differences between the groups according to a Tukey test. The groups marked with “a” did not show statistically significant differences from control cells. We analyzed by real-time PCR the expression of proinflammatory cytokines and chemokines in total head kidney leukocytes as well as in the two professional phagocytic cell types of gilthead seabream, namely acidophilic granulocytes and macrophages, that had been stimulated with different LPS. The mRNA levels of il1b, il6, ccl4, and il8 increased in a similar way in these cells after stimulation with EcLPS and PgLPS (data not shown). However, S-SaLPS and R-SmLPS had only a slight effect on the mRNA levels of these cytokines compared with EcLPS and PgLPS. Strikingly, there was no induction of mxc (data not shown), a gene whose expression in mammals is induced by engagement of the TLR4 by LPS and the subsequent activation of the TRIF-dependent pathway (5). The above results prompted us to analyze the ability of ultrapure EcLPS to activate in vitro head kidney leukocytes from the spotted green pufferfish, which lacks a TLR4 ortholog (9). Interestingly, the two serotypes of EcLPS used, 055:B5 and 0111:B4, were able to induce the expression of the proinflammatory cytokines il1b (Fig. 2⇓A), il6 (Fig. 2⇓B), and tnfa (Fig. 2⇓C), although each to a different extent. Thus, EcLPS serotype 055:B5 increased the mRNA levels of all these cytokines, whereas EcLPS serotype 0111:B4 only increased the mRNA level of il6. As expected, PgLPS, VaDNA, and flagellin strongly increased the mRNA levels of all the inflammatory genes analyzed. 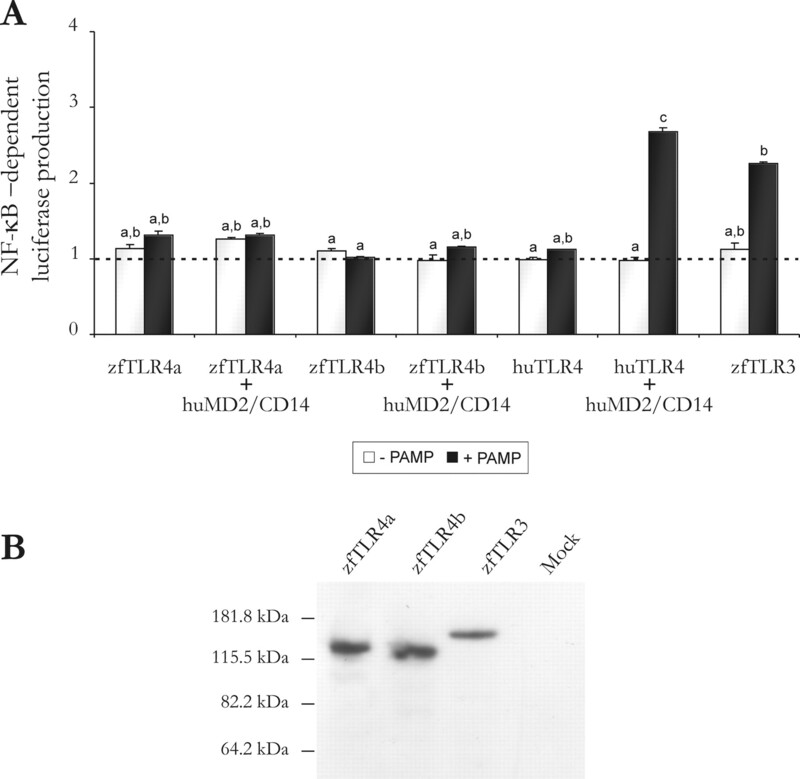 Taken together, the above results demonstrate that the activation of seabream and pufferfish leukocytes by EcLPS is not mediated by TLR4, and they strongly suggest the existence of an unidentified receptor for this PAMP. LPS induces the expression of proinflammatory cytokines in leukocytes from green spotted pufferfish. Total head kidney leukocytes were stimulated for 2 and 16 h with 10 μg/ml of EcLPS (serotypes 055:B5 and 0111:B4), 10 μg/ml of PgLPS, 50 μg/ml of VaDNA, and 1 μg/ml of flagellin, and the mRNA levels of the proinflammatory cytokines il1b (A), il6 (B), and tnfa (C) were determined by real-time RT-PCR. Gene expression is normalized against rps11 and is shown as relative to the mean of nonstimulated cells. Each bar represents the mean ± SE of triplicate samples. Different letters denote statistically significant differences between the groups according to a Tukey test. The groups marked with “a” did not show statistically significant differences from control cells. The recognition and activation of LPS by leukocytes from the pufferfish led us to hypothesize whether the two TLR4 orthologs of the zebrafish are involved in LPS recognition. As the mammalian TLR4 signals via MyD88- and TRIF/TRAM-dependent pathways, and only the latter pathway results in the production of IFN-β and several downstream genes, we analyzed the expression of MyD88-dependent and -independent genes in the injection site of zebrafish injected i.m. with different PAMPs. The results showed that the mRNA levels of several Myd88-dependent genes (e.g., il1b, il12, tnfa, and lta) increased with all the PAMPs tested, including ultrapure EcLPS of the serotype 0111:B4 (Fig. 3⇓A–D). However, the expression pattern and the kinetics of the gene induced by PgLPS and EcLPS were completely different, in accordance with previous data showing that EcLPS and PgLPS activate the immune response by different pathways (24, 25, 26). Interestingly, however, the TRIF-dependent genes analyzed (i.e., inf1 and mxc) were dramatically induced with poly(I:C), as was expected, although EcLPS failed to induce any of them (Fig. 3⇓, E and F). None of the treatments used affected the mRNA levels of ifn2 and ifn3 (data not shown). Therefore, these data reveal that, in contrast to what happens in mammals, LPS is not able to induce the expression of TRIF/TRAM-dependent genes in the zebrafish. LPS exclusively induces the expression of MyD88-dependent genes in the zebrafish. Zebrafish were injected in the left epaxial muscle with the indicated PAMPs, and the mRNA levels of il1b (A), il12 (B), tnfa (C) lta (D), inf1 (E), and mxc (F) were determined by real-time RT-PCR at different time points. Gene expression is normalized against rps11 and is shown as relative to the mean of nonstimulated cells. Each bar represents the mean ± SE of triplicate samples. Different letters denote statistically significant differences between the groups according to a Tukey test. The groups marked with “a” did not show statistically significant differences from controls. Since the zebrafish lacks the TLR4 costimulatory molecules MD-2 and CD14, HEK293 cells were transiently transfected with zebrafish TLR4a and TLR4b with or without human MD-2 and CD14, and the activation of the receptor was analyzed using a NF-κB luciferase reporter (Fig. 4⇓A). While expression of huTLR4/MD-2/CD14, but not TLR4 alone, promoted NF-κB activation upon addition of EcLPS, neither ortholog of the zebrafish induced the activation of the NF-κB whether alone or together with human MD-2 and CD14. Notably, activation of zebrafish TLR3 with poly(I:C) led to the induction of NF-κB, indicating that the signaling pathway is well conserved among fish and mammals. The expression levels of all zfTLRs were analyzed by Western blot using the V5 mAb and were found to be similar (Fig. 4⇓B). Ectopic expression of zebrafish TLR4a or TLR4b in HEK293 does not conferred sensitivity to LPS. The HEK/Elam-luc cells were transfected with expression constructs for zfTLR4a, zfTLR4b, zfTLR3, or huTLR4 alone or in combination with huMD-2 and huCD14. A, Forty-eight hours after transfection, cells were stimulated for 8 h with the specific ligand for each TLR, and the relative luciferase production was determined as described in Materials and Methods. Each bar represents the mean ± SE of triplicate samples. Different letters denote statistically significant differences between the groups according to a Tukey test. The groups marked with “a” did not show statistically significant differences from mock-transfected cells. B, The cells extracts from A were also probed with the anti-V5 mAb. To finally demonstrate the involvement of zebrafish TLRs in LPS signaling, we developed a zebrafish embryo model to study the NF-κB-signaling pathway using the classical NF-κB luciferase reporter system, combined with antisense MO-mediated knockdown (Table II⇑) or gene overexpression. We first used a translation-blocking MO against MyD88 that has been shown to impair embryo clearance of Salmonella (43). MyD88 morphants showed significantly reduced NF-κB induction when injected with VaDNA compared with the controls (TLR3 morphants and embryos not injected with MO) (Fig. 5⇓A). In sharp contrast, Myd88 morphants showed unaltered NF-κB induction when injected with EcLPS (Fig. 5⇓B). Additionally, the induction of NF-κB by EcLPS (either from 0111:B4 or 055:B5 strains) in TLR4a, TLR4b, and TLR4a/TLR4b morphants was also unaffected (Fig. 5⇓B). The effectiveness of MO to alter the splicing of zebrafish TLR4 transcripts was assayed by RT-PCR (Fig. 5⇓C). The results showed that the intron between exon 1 and exon 2 of zfTLR4a and zfTLR4b was not skipped out during splicing in MO-injected embryos. More specifically, integration of these introns created in-frame premature stop codons, resulting in truncated proteins lacking most of the extracellular domain as well as the transmembrane and TIR domains. Similar results were obtained with another MO (Table II⇑) for each zebrafish TLR4 (data not shown). No apparent developmental defects were observed in TLR4a, TLR4b, and MyD88 morphants (data not shown). All of these results demonstrated that the zebrafish orthologs of TLR4 are not involved in the recognition of LPS and that EcLPS induces NF-κB activation and the expression of proinflammatory cytokines via a MyD88-independent pathway. 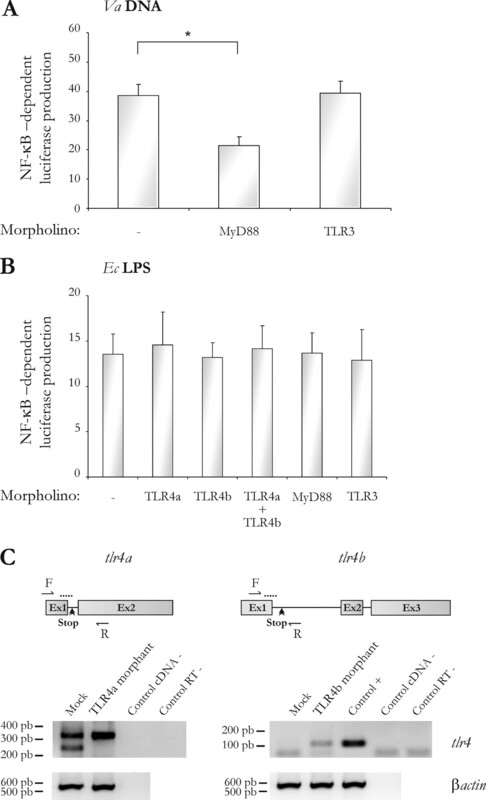 Zebrafish MyD88, TLR4a and TLR4b morphants show intact LPS responsiveness. Zebrafish one-cell embryos were microinjected with 6.5 ng of VaDNA (A) or 30 ng of EcLPS (B) and NF-κB luciferase and pRL-TK (10:1) reporter vectors alone or in combination with 4 ng of the indicated morpholinos. A and B, Twenty-four hours after microinjection, activation of the NF-κB was measured as described in Materials and Methods. The results are expressed as the mean ± SE of normalized luciferase activity relative to control embryos not injected with PAMPs. The asterisk denotes statistically significant differences between the indicated samples. C, RT-PCR analysis of zfTLR4 MO-induced altered splicing of zfTLR4 transcripts 24 h after microinjecton. The 246-bp intact zfTLR4a transcript was only detectable in uninjected embryo samples (Mock). A 107-bp product indicating the insertion of an intact intron between exons 1 and 2 of zfTLR4b was only observed in samples injected with MO and when genomic DNA was used as template (Control +), while it is absent in uninjected embryos (Mock). Samples lacking cDNA (cDNA −) and those obtained in the absence of reverse transcriptase (RT −) gave no amplification. The primer pairs (forward and reverse, respectively) used for amplification were (5′-TGCATGGGAAGAAACCTCA-3′/5′-CAAGCATCCAGGAGCAAAAT-3′) and (5′-TGAATGCTGGACAAGGACAG-3′/5′-TCTTAGGCTCACATTAACAGACCA-3′) for zfTLR4a and zfTLR4b, respectively. The annealing of MOs (dashed lines) and the in-frame premature stop codons (arrowheads) are indicated. As it has previously been shown that deletion of the extracellular domain of TLRs renders constitutively active mutants (44), we generated zebrafish TLR4b, TLR3, and TLR9 mutants lacking their extracellular domains (named zfTIR4b, zfTIR3, and zfTIR9, respectively). Interestingly, while overexpression of the huTIR4 (44), zfTIR3, and zfTIR9 induced the activation of NF-κB, overexpression of zfTIR4b slightly decreased basal NF-κB activation (Fig. 6⇓A). These results prompted us to examine the alignment of zebrafish and human TLR4 polypeptides. Notably, although the TIR domain is well conserved between fish and mammals, and almost identical in the two zebrafish paralogs (94% amino acid identity), they have a substitution (alanine instead of proline) in residue 681 of the TLR4a and 713 of TLR4b (corresponding to residue 712 of mouse TLR4 and 714 of human TLR4) (Fig. 7⇓). Replacement of proline with histidine at this position renders a nonfunctional mouse TLR4 (15). Therefore, we replaced alanine by histidine in wild-type zfTIR4b, and the resulting mutant was injected into zebrafish embryos. Interestingly, this mutant failed to inhibit the activation of NF-κB induced by VaDNA (Fig. 6⇓B). Furthermore, wild-type zfTIR4b dramatically decreased the activation of the NF-κB induced by human TIR4 or VaDNA (Fig. 6⇓, B and C). However, the zfTLR4b did not significantly affect the activation of the NK-κB induced by the huTIR4 (Fig. 6⇓C), suggesting that engagement of this receptor by its unknown ligand would negatively regulate NF-κB signaling in the zebrafish. Strikingly, overexpression of zfTIR4b or zfTLR4b had no effect on the activation of NF-κB induced by EcLPS (Fig. 6⇓C), further confirming that TLR4 is not the ligand for LPS in the zebrafish and suggesting that this receptor specifically inhibits the activation of NF-κB via the MyD88-dependent pathway. Zebrafish TLR4 negatively regulates NF-κB-signaling pathway. Zebrafish one-cell embryos were microinjected with NF-κB luciferase and pRL-TK (10:1) reporter vectors together with 6.5 ng of VaDNA, 30 ng of EcLPS, and/or 0.1–1.0 ng of the expression constructs zfTLR4b, zfTIR4b, zfTIR3, zfTIR9, zfTIR4b(Ala→His), and huTIR4. Twenty-four (A–C) and 48 (A) hours after microinjection, activation of the NF-κB was measured as described in Materials and Methods. The results are expressed as the mean ± SE of normalized luciferase activity relative to control embryos not injected with PAMPs. The asterisks denote statistically significant differences between the indicated samples. Multiple alignment of zebrafish and human TLR4. Identical and similar residues identified in all proteins are indicated by asterisks and colons, respectively. The predicted leader peptide and the transmembrane domain (gray), the TIR domain (Prosite accession no. PS50104) (boldface), and the residue important for the activity of mammalian TLR4 (#) are shown. The accession numbers for the sequences are CAH72619 for huTLR4, XP_001336007 for zfTLRa, and AAH68358 for zfTLR4b. Note that no apparent leader peptide is present in zfTLR4a. Earlier studies by Berczi and coworkers (32) unexpectedly found that lower vertebrates, most notably fish and amphibians, were resistant to the toxic effects of LPS. More recently, it has been shown that extremely high concentrations of LPS (μg/ml) are required to activate in vitro isolated leukocytes from several phylogenetically distant teleost species (33, 34, 35, 36, 37). Additionally, the availability of the sequence of the genome of several teleost species has revealed the presence of two TLR4 orthologs in an ancient teleost fish, the zebrafish (Cypriniformes), but its absence in more evolutionarily advanced pufferfishes (Tetraodon and Fugu, both Tetraodontiformes). This in silico work has also revealed that costimulatory molecules essential for LPS activation via TLR4 (i.e., MD-2 and CD14) are absent in all fish and amphibian genomes and expressed sequence tag databases available to date. Here, using different ultrapure LPS preparations, we have demonstrated that leukocytes from seabream, Tetraodon, and zebrafish are indeed able to respond to this PAMP with much lower sensitivity than mammals and via a TLR4/MyD88-independent signaling pathway. This observation is supported by 1) the activation of seabream leukocytes by ultrapure LPS and lipid A from E. coli, 2) the absence of a TLR4 ortholog in Tetraodon, 3) the intact LPS responsiveness of TLR4a, TLR4b, and MyD88 morphant zebrafish embryos, and 4) the ability of zfTIR to negatively regulate in zebrafish embryos the induction of NF-κB by bacterial DNA (TLR9 agonist) or the overexpression of a constitutively active human TLR4 but not by LPS. In mammals, TLR4 is a promiscuous receptor able to recognize not only LPS but also different endogenous ligands from damaged/stressed tissues, such us high-mobility group box 1 (HMGB1), hyaluronan, and biglycan (45, 46). For the recognition of most of these ligands, MD-2 seems to be indispensable but CD14 may not be essential (18, 47, 48). In fact, MD-2, but not TLR4, is responsible for the binding of LPS (23). Although the absence of MD-2 and CD14 orthologs in fish makes it difficult to predict the ligand of zfTLR4s, our results suggest that the ability of this receptor to recognize LPS, and probably most of these endogenous ligands, was acquired after the divergence of fish and tetrapods. As Drosophila Toll is an activator and directly recognizes the endogenous ligand Spaetzle rather than structural microbial patterns (3), we propose that the ancestor of vertebrate TLR4 was originally devoted to the recognition of an unknown endogenous ligand, and its association in higher vertebrates with MD-2 and other co-receptors, such as CD14 or CD44 (48), increased its promiscuity. However, in fish, and probably amphibians, TLR4 has been lost in most species, with the exception of the order Cypriniformes, where loss-of-function mutation(s) of the TIR domain allowed its retention as a negative regulator of the TLR-signaling pathway, which was duplicated later in these fish. One of the most exciting contributions of the present study is that the zebrafish TIR4 acts as a negative regulator of TLR functions, while the zfTLR4b fails to do so. This suggests that engagement of this receptor by its unknown ligand would negatively regulate NF-κB signaling in the zebrafish. This result is supported by the presence of a nonconservative substitution (alanine instead of proline) in the TIR domain of zfTLR4s (residue 681 of the TLR4a and 713 of TLR4b, which correspond to residue 712 of mouse TLR4 and 714 of human TLR4). This is not surprising since the Pro→His point mutation of mouse TLR4, which is found in the LPS-unresponsive C3H/HeJ strain, renders a nonfunctional mouse TLR4 (15), which exerts a dominant negative effect on LPS signal transduction (49). In fact, the substitution of this alanine by histidine in the zfTIR4b also renders a nonfunctional TIR4b domain, which is unable to inhibit NF-κB activation. On the other hand, neither zfTIR4b nor zfTLR4b has an effect on the activation of NF-κB induced by EcLPS, further confirming that TLR4 is not the ligand for LPS in the zebrafish and suggesting that this receptor specifically inhibits the activation of NF-κB via the MyD88-dependent pathway. Therefore, zfTLR4s might act by sequestering the TLR adaptors within the TLR signaling pathway, as has recently been shown for mouse ST2L (50), a type-1 transmembrane receptor with a cytoplasmic TIR domain and an extracellular region that contains three Ig-like domains. However, note that there are conflicting reports on the actions of ST2L, as Schmitz et al. (51) described that ST2L was a receptor for the recently identified member of the IL-1 family IL-33, which exerts its biological effects via the ST2L-enhanced activation of NF-κB and MAPK. Whatever the case, we report for the first time the existence of a TLR that would negatively regulate TLR signaling upon engagement with its specific ligand. The identification of the ligand of zfTLR4 and the receptor of LPS in fish will shed light into the evolution of the Toll family. We think that our identification of TLR4 as a negative regulator of TLR signaling in the zebrafish together with the absence of this receptor in most fish species would explain the resistance of fish to the toxic effects of LPS and the high concentrations of this substance required to activate the immune cells of these animals. We thank I. Fuentes and E. M. García-Navarro for excellent technical assistance, to Dr. M. Lamphier for the HEK/Elam-luc cells, Dr. R. Hay for the NF-κB luciferase reporter construct, Dr. R. Medzhitov for the huTIR4 construct, and Dr. M. F. Smith, Jr. for the huTLR4, huMD-2, and huCD14 constructs. ↵1 This work was supported by the Spanish Ministry of Education and Science (Grants BIO2005-05078 and CSD2007-00002 to V.M. ), the Sixth Framework Programme of the European Union (Grant FOOD-CT-2005-007103 to V.M. ), the Spanish Ministry of Health (Grant PI060369 to M.L.C. ), and the University of Murcia (fellowships to F.A.-P. and A.L.-M.). ↵2 F.A.-P. and A.L-M. contributed equally to this work. ↵4 Abbreviations used in this paper: Ec, Escherichia coli; hu, human; LRR, leucine-rich repeats; MD-2, myeloid differentiation protein 2; MO, morpholino; PAMP, pathogen-associated molecular pattern; Pg, Porphyromonas gingivalis; P/S, penicillin and streptomycin; R, rough LPS; S, smooth LPS; Sa, Salmonella abortus equi; Sm, Salmonella minnesota; St, Salmonella thyphimurium; TIR, Toll/IL-1 receptor; TRIF, TIR domain-containing adapter inducing IFN-β; TRAM, TRIF-related adapter molecule; VaDNA, Vibrio anguillarum genomic DNA; zf, zebrafish. Aderem, A., R. J. Ulevitch. 2000. Toll-like receptors in the induction of the innate immune response. Nature 406: 782-787. Medzhitov, R., C. A. Janeway. 2000. Innate immune recognition: mechanisms and pathways. Immunol. Rev. 173: 89-97. Hoffmann, J. A., J. M. Reichhart. 2002. Drosophila innate immunity: an evolutionary perspective. Nat. Immunol. 3: 121-126. Xu, Y., X. Tao, B. Shen, T. Horng, R. Medzhitov, J. L. Manley, L. Tong. 2000. Structural basis for signal transduction by the Toll/interleukin-1 receptor domains. Nature 408: 111-115. Akira, S., K. Takeda. 2004. Toll-like receptors signaling. Nat. Rev. Immunol. 4: 499-511. Oshiumi, H., M. Sasai, K. Shida, T. Fujita, M. Matsumoto, T. Seya. 2003. Prediction of the prototype of the human Toll-like receptor gene family from the pufferfish, Fugu rubripes, genome. Immunogenetics 54: 791-800. Jault, C., L. Pichon, J. Chluba. 2004. Toll-like receptor gene family and TIR-domain adapters in Danio rerio. Mol. Immunol. 40: 759-771. Meijer, A. H., S. F. Gabby Krens, I. A. Medina Rodríguez, S. He, W. Bitter, B. Ewa Snaar-Jagalska, H. P. Spaink. 2004. Expression analysis of the Toll-like receptor and TIR domain adaptor families of zebrafish. Mol. Immunol. 40: 773-783. Roach, J. C., G. Glusman, L. Rowen, A. Kaur, M. K. Purcell, K. D. Smith, L. E. Hood, A. Aderem. 2005. The evolution of vertebrate Toll-like receptors. Proc. Natl. Acad. Sci. USA 102: 9577-9582. Tsujita, T., H. Tsukada, M. Nakao, H. Oshiumi, M. Matsumoto, T. Seya. 2004. Sensing bacterial flagellin by membrane and soluble orthologs of Toll-like receptor 5 in rainbow trout (Onchorhynchus mikiss). J. Biol. Chem. 279: 48588-48597. Takano, T., H. Kondo, I. Hirono, M. Endo, T. Saito-Taki, T. Aoki. 2007. Molecular cloning and characterization of Toll-like receptor 9 in Japanese flounder Paralichthys olivaceus. Mol. Immunol. 44: 1845-1853. Bishop, R. E.. 2005. Fundamentals of endotoxin structure and function. Contrib. Microbiol. 12: 1-27. Raetz, C. R., C. Whitfield. 2002. Lipopolysaccharide endotoxins. Annu. Rev. Biochem. 71: 635-700. Huber, M., C. Kalis, S. Keck, Z. Jiang, P. Georgel, X. Du, L. Shamel, S. Sovath, S. Mudd, B. Beutler, et al 2006. R-form LPS, the master key to the activation ofTLR4/MD-2-positive cells. Eur. J. Immunol. 36: 701-711. Qureshi, S. T., L. Larivière, G. Leveque, S. Clermont, K. J. Moore, P. P-Gros, D. Malo. 1999. Endotoxin-tolerant mice have mutations in Toll-like receptor 4 (Tlr4). J. Exp. Med. 189: 615-625. Jiang, Z., P. Georgel, X. Du, L. Shamel, S. Sovath, S. Mudd, M. Huber, C. Kalis, S. Keck, C. Galanos, et al 2005. CD14 is required for MyD88-independent LPS signaling. Nat. Immunol. 6: 565-570. Nagai, Y., S. Akashi, M. Nagafuku, M. Ogata, Y. Iwakura, S. Akira, T. Kitamura, A. Kosugi, M. Kimoto, K. Miyake. 2002. Essential role of MD-2 in LPS responsiveness and TLR4 distribution. Nat. Immunol. 3: 667-672. Kimoto, M., K. Nagasawa, K. Miyake. 2003. Role of TLR4/MD-2 and RP105/MD-1 in innate recognition of lipopolysaccharide. Scand. J. Infect. Dis. 35: 568-572. Wright, S. D., R. A. Ramos, P. S. Tobias, R. J. Ulevitch, J. C. Mathison. 1990. CD14, a receptor for complexes of lipopolysaccharide (LPS) and LPS binding protein. Science 49: 1431-1433. Tapping, R. I., P. S. Tobias. 2000. Soluble CD14-mediated cellular responses to lipopolysaccharide. Chem. Immunol. 74: 108-121. Kim, H. M., B. S. Park, J. I. Kim, S. E. Kim, J. Lee, S. C. Oh, P. Enkhbayar, N. Matsushima, H. Lee, O. J. Yoo, J. O. Lee. 2007. Crystal structure of the TLR4-MD-2 complex with bound endotoxin antagonist Eritoran. Cell 130: 906-917. Werts, C., I R. Tapping, J. C. Mathison, T. H. Chuang, V. Kravchenko, I. Saint Girons, D. A. Haake, P. J. Godowski, F. Hayashi, A. Ozinsky, et al 2001. Leptospiral lipopolysaccharide activates cells through a TLR2-dependent mechanism. Nat. Immunol. 2: 346-352. Hirschfeld, M., J. J. Weis, V. Toshchakov, C. A. Salkowski, M. J. Cody, D. C. Ward, N. Qureshi, S. M. Michalek, S. N. Vogel. 2001. Signaling by Toll-like receptor 2 and 4 agonists results in differential gene expression in murine macrophages. Infect. Immun. 69: 1477-1482. Darveau, R. P., T. T. Pham, K. Lemley, R. A. Reife, B. W. Bainbridge, S. R. Coats, W. N. Howald, S. S. Way, A. M. Hajjar. 2004. Porphyromonas gingivalis lipopolysaccharide contains multiple lipid A species that functionally interact with both Toll-like receptors 2 and 4. Infect. Immun. 72: 5041-5051. Kirikae, T., T. Nitta, F. Kirikae, Y. Suda, S. Kusumoto, N. Qureshi, M. Nakano. 1999. 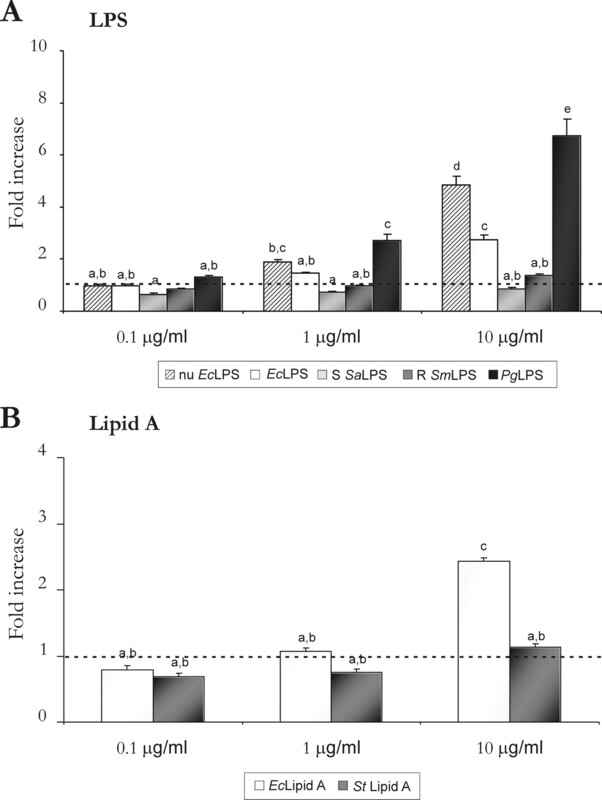 Lipopolysaccharides (LPS) of oral black-pigmented bacteria induce tumor necrosis factor production by LPS-refractory C3H/HeJ macrophages in a way different from that of Salmonella LPS. Infect. Immun. 67: 1736-1742. Tanamoto, K., S. Azumi, Y. Haishima, H. Kumada, T. Umemoto. 1997. The lipid A moiety of Porphyromonas gingivalis lipopolysaccharide specifically mediates the activation of C3H/HeJ mice. J. Immunol. 158: 4430-4436. O'neill, L. A., A. G. Bowie. 2007. The family of five: TIR-domain-containing adaptors in Toll-like receptor signaling. Nat. Rev. Immunol. 7: 353-364. Vogel, S. N., K. A. Fitzgerald, M. J. Fenton. 2003. TLRs: differential adapter utilization by Toll-like receptors mediates TLR-specific patterns off gene expression. Mol. Interv. 3: 466-477. Miggin, S. M., L. A. O'Neill. 2006. New insights into the regulation of TLR signaling. J. Leukocyte Biol. 80: 220-226. Berczi, I., L. Bertok, T. Bereznai. 1966. Comparative studies on the toxicity of Escherichia coli lipopolysaccharide endotoxin in various animal species. Can. J. Microbiol. 12: 1070-1071. Sepulcre, M. P., G. López-Castejón, J. Meseguer, V. Mulero. 2007. The activation of gilthead seabream professional phagocytes by different PAMPs underlines the behavioural diversity of the main innate immune cells of bony fish. Mol. Immunol. 44: 2009-2016. Pelegrín, P., J. García-Castillo, V. Mulero, J. Meseguer. 2001. Interleukin-1β isolated from a marine fish reveals up-regulated expression in macrophages following activation with lipopolysaccharide and lymphokines. Cytokine 16: 67-72. MacKenzie, S., J. V. Planas, F. W. Goetz. 2003. LPS-stimulated expression of a tumor necrosis factor-α mRNA in primary trout monocytes and in vitro differentiated macrophages. Dev. Comp. Immunol. 27: 393-400. Stafford, J. L., K. K. Ellestad, K. E. Magor, M. Belosevic, B. G. Magor. 2003. A Toll-like receptor (TLR) gene that is up-regulated in activated goldfish macrophages. Dev. Comp. Immunol. 27: 685-698. Zou, J., C. Tafalla, J. Truckle, C. J. Secombes. 2007. Identification of a second group of type I IFNs in fish sheds light on IFN evolution in vertebrates. J. Immunol. 179: 3859-3871. Westerfield, M.. 2000. The Zebrafish Book: A Guide for the Laboratory Use of Zebrafish (Danio rerio) University of Oregon Press, Eugene, OR. Sepulcre, M. P., P. Pelegrín, V. Mulero, J. Meseguer. 2002. Characterisation of gilthead seabream acidophilic granulocytes by a monoclonal antibody unequivocally points to their involvement in fish phagocytic response. Cell Tissue Res. 308: 97-102. Roca, F. J., M. P. Sepulcre, G. López-Castejón, J. Meseguer, V. Mulero. 2006. The colony-stimulator factor-1 is a specific marker for macrophages from the bony fish githead seabream. Mol. Immunol. 43: 1418-1423. Mulero, V., P. Pelegrín, M. P. Sepulcre, J. Muñoz, J. Meseguer. 2001. A fish cell surface receptor defined by a mAb mediates leukocyte aggregation and deactivation. Dev. Comp. Immunol. 25: 619-627. López-Castejón, G., M. P. Sepulcre, F. J. Roca, B. Castellana, J. V. Planas, J. Meseguer, V. Mulero. 2007. 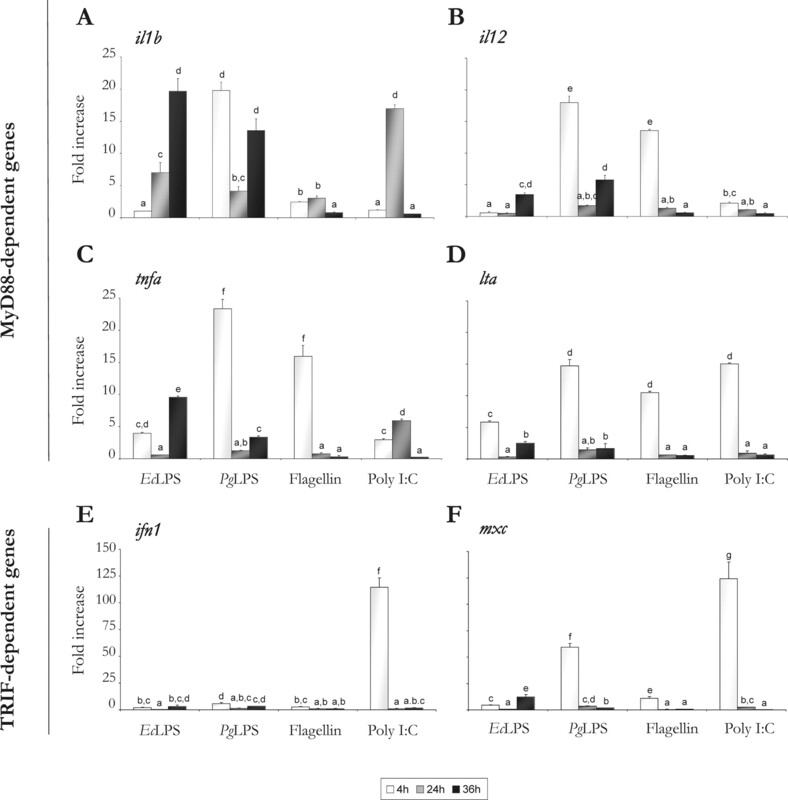 The type II interleukin-1 receptor (IL-1RII) of the bony fish gilthead seabream Sparus aurata is strongly induced after infection and tightly regulated at transcriptional and post-transcriptional levels. Mol. Immunol. 44: 2772-2780.
van der Sar, A. M., O. W. Stockhammer, C. van der Laan, H. P. Spaink, W. Bitter, A. H. Meijer. 2006. MyD88 innate immune function in a zebrafish embryo infection model. Infect. Immun. 74: 2436-2441. Beg, A. A.. 2002. Endogenous ligands of Toll-like receptors: implications for regulating inflammatory and immune responses. Trends Immunol. 23: 509-512. Marshak-Rothstein, A.. 2006. Toll-like receptors in systemic autoimmune disease. Nat. Rev. Immunol. 6: 823-835. Schaefer, L., A. Babelova, E. Kiss, H. J. Hausser, M. Baliova, M. Krzyzankova, G. Marsche, M. F. Young, D. Mihalik, M. Götte, et al 2005. The matrix component biglycan is proinflammatory and signals through Toll-like receptors 4 and 2 in macrophages. J. Clin. Invest. 115: 2223-2233. Taylor, K. R., K. Yamasaki, K. A. Radek, A. Di Nardo, H. Goodarzi, D. Golenbock, B. Beutler, R. L. Gallo. 2007. Recognition of hyaluronan released in sterile injury involves a unique receptor complex dependent on Toll-like receptor 4, CD44, and MD-2. J. Biol. Chem. 282: 18265-18275. Rosenstreich, D. L., S. N. Vogel, A. R. Jacques, L. M. Wahl, J. J. Oppenheim. 1978. Macrophage sensitivity to endotoxin: genetic control by a single codominant gene. J. Immunol. 121: 1664-1670. Brint, E. K., D. Xu, H. Liu, A. Dunne, A. N. McKenzie, L. A. O'Neill, F. Y. Liew. 2004. ST2 is an inhibitor of interleukin 1 receptor and Toll-like receptor 4 signaling and maintains endotoxin tolerance. Nat. Immunol. 5: 373-379.